The perfect gift for every age, from toddlers to teenagers to grandparents and everyone in between! You're definitely not limited to what's shown here, I can make this in any color/fabric combination...I have a great selection of all different types of fabrics, so just ask if you don't see what you're looking for. Ordering is easy! Simply tell me your favorite colors and the name/initials to be embroidered and I will do the rest! (See ordering instructions below). This listing is for a standard size pillowcase (which fits a standard size pillow), and does NOT include the pillow. 1. Your minky choice for the main part of the pillowcase, and your minky choice for the band of the pillowcase. PLEASE NOTE: As this pillowcase is custom-made specifically for you, please check my home page for my current turnaround time. 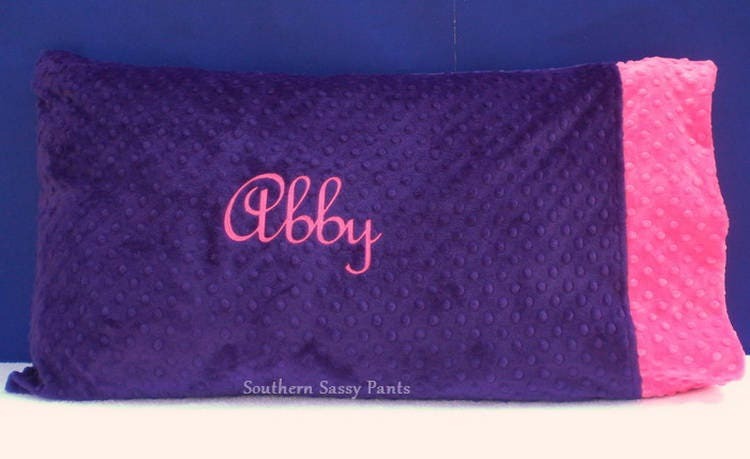 *Minky pillowcases ship via Priority Mail in the U.S.
My daughter was gifted the smaller version on her 2nd birthday. She is 7-1/2 and finally asked for a “big” pillow case for a larger pillow. Bittersweet for me as the smaller one has gone everywhere with her, but she is so excited to sleep on her new pillow tonight. It’s perfect and we couldn’t be happier! Beautiful blanket and the owner was super fast and sweet! I gave as a baby gift and the mom was so touched and loved it. Thank you!